Most know the Tasman Peninsula for Port Arthur Historic Site. If you haven’t been, plan your day around this destination. It is the country’s best preserved convict site and one to absorb slowly and thoughtfully. Leaving from Lenna of Hobart a fine heritage hotel in Battery Point and one of the top hotels in Hobart, a must-stop on the way down the Peninsula is Bangor Wine & Oyster Shed. As per its name, Bangor brims with oyster and wine offerings. In fact, you can even see the vines from your table, and the waters from which your Pacific oysters are plucked. Its genuine paddock and ocean to plate! The staff have a friendly country way about them and if you don’t feel like driving, one can also arrive by chopper for lunch at Bangor. The Coal Mines Historic Site is well worth exploring. It is where the very worst convicts were sent and marks Tasmania’s first operational mine. There’s also a lovely walk that departs from the Lime Bay camping area. Continuing down the peninsula, stop at Pirates Bay Lookout. Not only is the view staggering, but Cubed Espresso offers great coffee and sweet treats from their petite van. 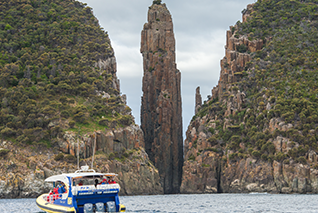 Venture down to the Tessellated Pavement, Devil’s Kitchen and other natural rock formations of the Eaglehawk Neck area. Closer to Port Arthur, the lavender farm is an ideal place to drop into if you have an inkling for purple-tinted ice-cream. It’s delicious! Osborne Heli Tours are close neighbours and offer amazing flights over some of Australia’s tallest sea cliffs. Spend time at Port Arthur including a cruise out to the Isle of the Dead. Alternately, return come nightfall and hop on a ghost tour by lantern light. There are plenty of options in the region – even a day spent gin making with Master Distiller Bill McHenry. Those looking for a great little day walk might also be tempted by a wander into Crescent Bay. Remarkable Cave is also, let’s just say, remarkable. If you look at this natural wonder long enough, you might just see the shape of Tasmania in its form.